For each of the last two springs in this house, the peony plant in the back yard has given me exactly one bloom. This week, there were eight — all but two opening fully on the same day. Their stems are very curved from being knocked over earlier in the month by a late snow and then rain and wind. Next year, I will try to remember to rig up some sort of support before they emerge. The blooms look red, but they’re actually a very dark pink, and they have a nice light scent. I arranged them with some wild pink geranium that comes up along the back fence (maybe G. palustre?) and some sweet woodruff. The Westerwald salt-glazed pottery pitcher is from this Saturday’s flea market. To see what other bloggers have put in a vase today, please visit Cathy at Rambling in the Garden. She hosts this Monday theme. I love peonies. I don’t know why I don’t have more of them. Nice arrangement. Happy IAVOM. Beautiful! A lovely photograph and such beautiful blooms! I think it’s too warm for them here, but I notice that a nursery an hour inland from us has them for sale. It is a little colder there, but maybe worth a try. I’ve never looked into it, but perhaps some varieties of peonies require less cold weather than others? I always look in his books when I need a great garden quote. They really are. 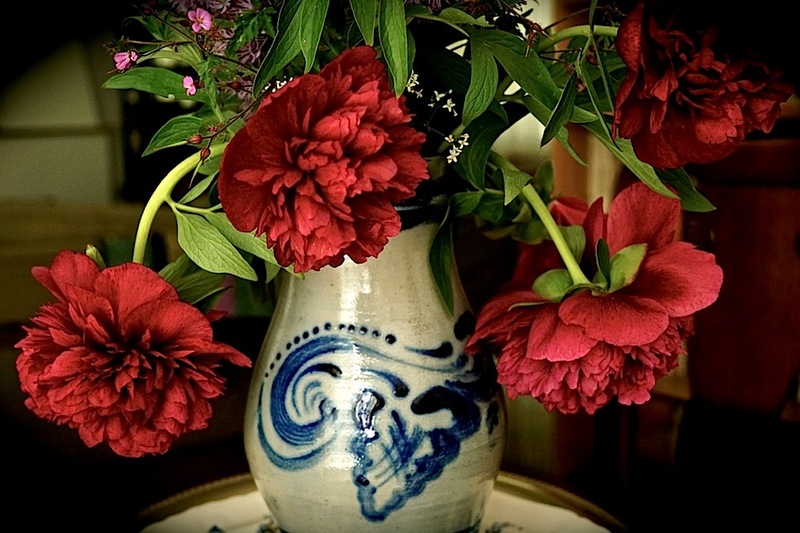 Peonies rule — for such a brief time. Beautiful. Those doubles really need support in the garden but I like them drooping in the vase. Much more interesting than standing straight. Peonies seems like such a valuable bloom that it’s hard to make a decision about how to cut and arrange them. Their color in the photo is a little warmer than they really are because I was trying to compensate for the low light. But I always thought of them as dark red until all the petals fell off one of them, and I could see that they were really dark pink. As the remaining blooms are aging, they are looking more pink too. Gorgeous – love the photo, too! Oh gorgeous. You must be thrilled to get so many flowers at last. Your vase is lovely too. I was pleased to get the pitcher at the flea market on Saturday for only 5 euros. It does have a little nick at the top, but the flowers cover that up. I’m thinking of getting a little silver leaf and trying to gild its little cracks and chipped places like I’ve seen on some Japanese pottery. Traditionally, pitchers like this were used in Frankfurt to serve apple wine. the pitcher is lovely as is, but Japanese repaired with love sounds good too.